Giving birth in the car – Impressive! Mum gave birth in the car – Dad driving and three kids in the back seat…Impressive! Back in February, I got a message from Anna. I had cast her three boys almost three years ago and it was lovely news to hear that baby number four, A GIRL! Was due at the end of April. We started to plan her expected baby’s casts while she was just a bump. All we needed now was a baby! I remember jokingly suggesting it would be good if she arrived early. Little did we know then, that this little lady planned to make a fairly impressive entrance into the world! I was 38 weeks & 3 days pregnant with my 4th Baby…A GIRL. At roughly 3:30 pm I had woken up from a nap (pregnancy just drains it out of you growing this wonderful human). I had woken up with slight pains, bearable but definitely felt like it was going to progress into labour at some point – just not as soon as I was planning. My husband was at work (he is a bus driver) & his break was coming up. He called about 3:50pm while these pains were much stronger & getting closer together. I advised my husband to ask his boss if he could come home ASAP as I had a feeling I was going to go into labour in a few hours, & this was the start of things. He was due to drive to Edinburgh after his break so that wasn’t a good idea, in case he missed the birth. It was now 4:20pm (30mins after our phone call) & my husband still was not home. By this point, I was in A LOT of pain. I ran myself a bath to see if that would help ease the discomfort. The contractions were pretty close together & getting unbearable. Whilst my bath was running I finally got a message at 4:36pm to say he was on his way home & that his boss got his shift covered for the rest of the day. So I jumped in the bath & I got my “contraction timer app” out to time my pains/contractions & they were already 2-3mins apart!!! By this point I couldn’t move with the pain & the bath was just not helping one bit. My husband walked through the door at 4:45pm to find me in the bath in a lot of pain so he got straight on the phone to Victoria Hospital to get advice. They told us to come in straight away & that they’d have a room ready for us. I struggled to get out the bath because of how close & painful my contractions were but I finally got out & luckily I put on a MAXI DRESS with no pants lol. I wasn’t thinking about underwear at this point! I grabbed the first thing I could find & it was a dress. My husband got my other 3 children in the back of the car plus my hospital bag whilst I was getting my dress & shoes on. Half way down the Standing Stane Road I felt the urge to PUSH!!! My Husband begged me not to, but my body wanted to. I did my first push in the car as we hit the caravan site at the roundabout. I told him to lift my dress up as I needed to PUSH AGAIN & I could feel her coming out. I did my 2nd PUSH & her HEAD was out all I kept saying was “HER HEADS OUT, HER HEADS OUT OMG OMG OMG”. He panicked. At the 2nd roundabout he pulled up outside the Cash & Carry/the Test Center & jumped straight out the car and phoned the Ambulance Center. Whilst he was on the phone to them I did my 3rd & final PUSH & my baby girl came out completely & was born at 5:13pm. Luckily my husband had already phoned the ambulance as my Baby Girl was born in her SAC & the cord was wrapped around her neck. We couldn’t get to her as she was under my bum on the seat. 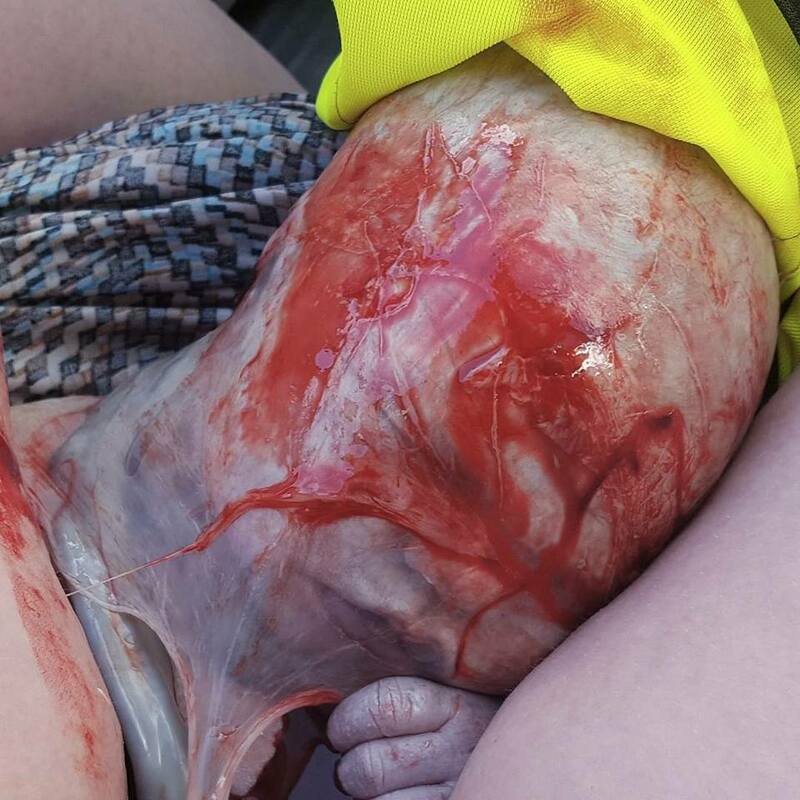 The ambulance arrived 2mins after my husband had made the call & they burst the rest of her AMNIOTIC SAC & got the cord off her neck and placed her under my Maxi Dress onto my chest. After all this commotion I still managed to grab my phone & take a picture of my Princess hehe. During all this my 3 Boys were in the back seat of the car and witnessed their little sister enter the World in a very Dramatic and unforgettably fast entrance. My Oldest Son started crying once he heard his wee sisters first cry. My husband was in a state himself as he didn’t know what had just happened and i was just relieved to have my baby girl safe & well on my chest. I got taken to Victoria Hospital in the Ambulance whilst my husband took the children to my mothers & he came to the hospital once he’d made sure they were all OK & fine. 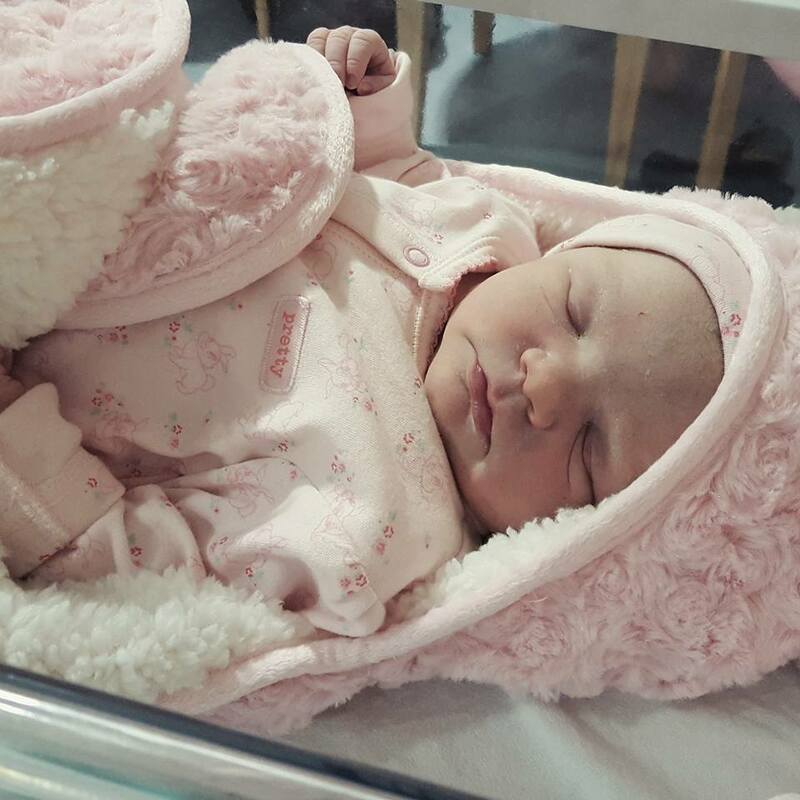 Arianna weighed 8lb 10oz & was 11 days early with 40 mins from the 1st unbearable contraction to her birth! Did you know I offer a reminder service to pregnant mums? It lets expectant mums plan ahead. 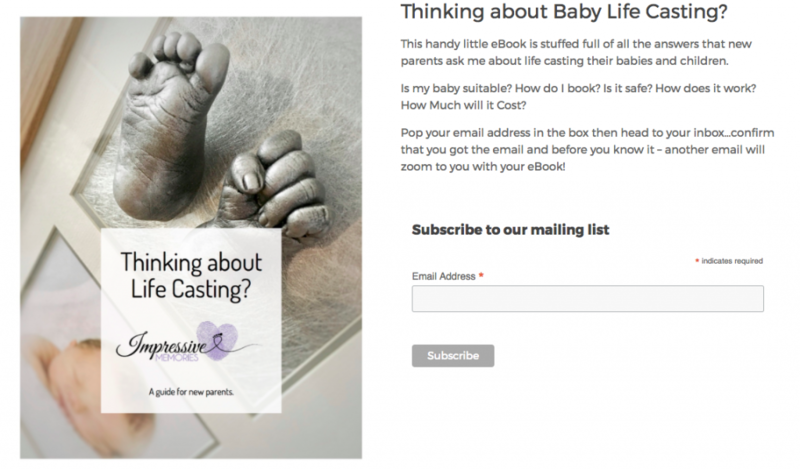 I help them know when they should start to think about making their booking, how to reschedule if baby arrives early or late, and lets you plan your casts before baby arrives. It’s one less thing to think about after baby is born and you are extremely busy (and have less time to be online, because new babies are quite time consuming!!) If you’d like to do this, just drop me a message. We were all prepared (or so we thought). Anna fancied reframing the boy’s casts so we discussed the new frame options I now offered, and how we could update the boy’s frame, and make it match their baby sister when she arrived. I offer several different frames but Anna was looking for something different. That wasn’t a problem. We designed and planned a bespoke frame and totally unique design for her babies. I knew what was best for her casts and she knew what worked best for their home. Together we planned these absolutely gorgeous frames for their casts, and this week they will head home to be adored for a lifetime. I think we’d all agree that baby Arianna and all three of her big brothers are very Impressive – but the real hero in this story is their truly amazing mum, Anna. Giving birth is never an easy task but to manage to remain calm under these circumstances, with three young children watching, shows that this mum is quite simply outstanding! Not sure I’d have managed to do it! And I never want to find out!! Could you have done it? Creating 3D lifecasts of new arrivals and siblings is an amazing way to capture a moment. Often children will remember the arrival of a new baby, but they might not remember what they looked like at the time. Looking back on a family heirloom means the whole family can share, touch and feel the moment – forever. If you’d like to learn more about lifecasting you can download my eBook HERE or click the image below. How was YOUR experience of giving birth? ← Feedback: How was it for you? Great story Jen and great idea about the reminder service too. Well done!